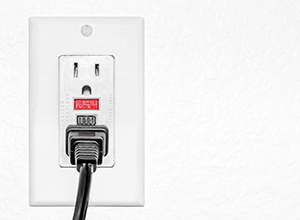 Are your outlets and switches trying to tell you something? When you flip the switch in your kitchen, or living room does it stick or crackle? Then you need new switches … and probably outlets too! The wiring in your home has a fairly long lifespan, but the switches and outlets, due to regular use, don’t last much longer than 15 – 20 years and should be replaced. That’s why at ElectriCall we will test and assess your outlets and switches for performance and give our recommendations whether they should be replaced or not. One important thing you should know is that some electricians, who are essentially commissioned sales representatives, will suggest you replace all your switches and outlets when they are at your home for other services. We don’t appreciate the reputation these unscrupulous tactics give electricians everywhere! That’s why you want to make sure you are dealing with an electrician who has your best interest at heart. At ElectriCall, we will test your switches and outlets and tell you honestly whether you need new outlets and switches or not. We believe in providing superior electrical services and providing exceptional value. That has earned us a positive reputation for being honest, and we have a lot of repeat business from our clients because of it. Like I said, switches and outlets do wear out, and they can be dangerous when that happens, but they don’t need to be replaced every 5 years. If you want a second opinion, or to have your switches and outlets tested, feel free to call us at 720-879-2253 today! Planning to Remodel or Upgrade Your Home? Are you in the middle of remodeling or upgrading your home? Did you know that updating your current switches to newer more beautiful switches can completely change the look of your home? Did you know that switches now have functionality that allows them to be tapped, touched, or waved like the ones manufactured by Legrand Adorne switches and outlets? We have helped many homeowners with remodeling projects that include new outlets and switches. Call us today, 720-879-2253, to get a quote for help with your home remodel.